1. For the brine: place all the ingredients except the brisket in a pan and bring to the boil, mix well and leave to cool down completely. Put the brisket in and leave for 24 hours or preferably 2 days (in the fridge). Remove from the brine and wash in cold water for 1 hour. 2. For the marinade: place all the ingredients in a large sauce pan over medium heat and bring to a boil. Reduce the heat and allow to simmer for 20 minutes before straining the liquid through a fine sieve. 3. Preheat the oven to 110ºC, gas mark ¼. Sear the brisket in a hot pan with little oil, until all the sides are caramelized. Place in a deep sided roasting tray and add the marinade. Cook in a preheated oven for 5 hours, covering with foil halfway through. 4. After the time has elapsed, allow the brisket to cool in the liquid. Then strain the liquid through a fine sieve and place in a pan over medium heat and allow to reduce to sauce consistency. Add the brisket and brush some of the sauce on while turning it on all sides until heated through. 5. For the slaw: in a bowl, mix the cabbage with the orange zest and juice. Add the lime juice and a pinch of salt. Cover with clingfilm and place in the fridge for 20 minutes. Meanwhile, toast the coriander seeds, cumin seeds and star anise in a pan over medium heat for a couple of minutes. Using a pestle and mortar, grind the seeds to a coarse powder then mix the spices with the slaw and season with salt. 6. 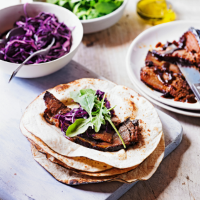 To serve, place rocket leaves in the lower half of a warm tortilla and add slices of the brisket. Top with some slaw and finish with some sweetcorn salsa. Fold the 2 ends in and roll the tortilla into a tight roll.